Sometimes called wheel chain cutters, these hydraulic pipe cutters are powered by a portable manual hydraulic pump that provides the reliability of manual operation with the improved force of a hydraulic tool. 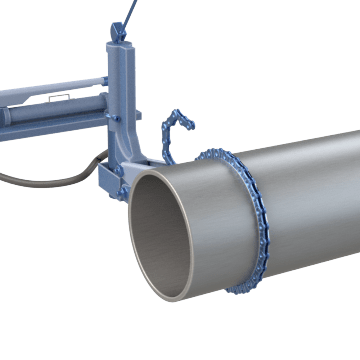 Suitable for use in trenches and other confined spaces, these cutters have a chain that is wrapped around the pipe and tightened to apply even pressure. Unlike chains that are rotated to perform the cut, these chains have individual cutters along the surface of the chain that perform the cut as the chain is tightened around the pipe. They are compact enough to be used in hard-to-reach areas or on underground or overhead fixtures.